Too many numbers, lack of focus and bad formatting make tables impossible to understand and energy consuming for your audience. Follow these 8 simple tips to make effective tables that you can use with pride in your presentation. If you need to present numbers, you may believe (like me and Gene Zelazny) that graphs and visuals are the best way to go. But if you (your company or audience) are number-hungry, maybe you’ll still need to include a table in your presentation from time-to-time. This is the kind of table that might drive Don McMillan mad in “Death by PowerPoint” . It is bad because there is no message, there is too much data and nothing stands out. 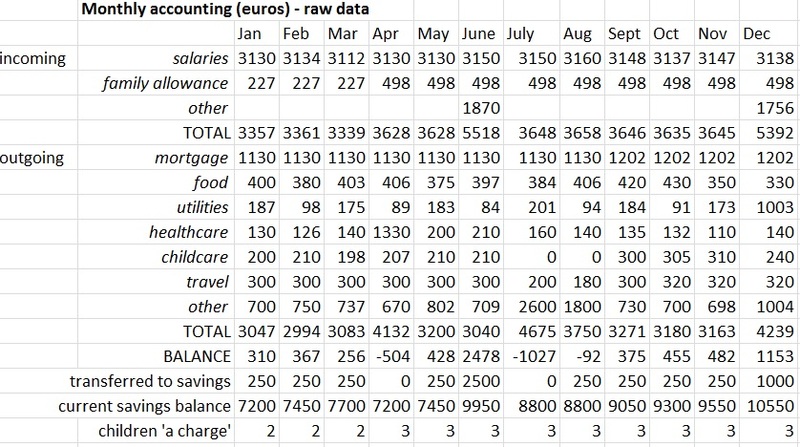 …now you have a nice raw-data table for your appendix or hand-out. So, if you want to make effective tables that you can use with pride in your presentation, concentrate on your key message, reduce useless data and bring more focus to what counts. Got any more examples? Share them please! Sometimes I see presenters taking audience questions with a serious, stern looking face and I wonder how the person asking the question felt about that. The presenter is not doing it intentionally (just concentrated) but really looks mean! They need to use their “listening to kids” face…. If you want more tips for a good charming listening face, read “The Power of Charm” by @BrianTracy and Ron Arden. Its a very easy to use and easy to read guide to active listening. During Presentation Skills training, we learn all about the 4 pillars of an effective presentation: Message, Structure, Content and Style. In content and style, we also look at how visual supports are used to support and message and speech: What would be the minimum effective dose when it comes to discussing a certain topic? 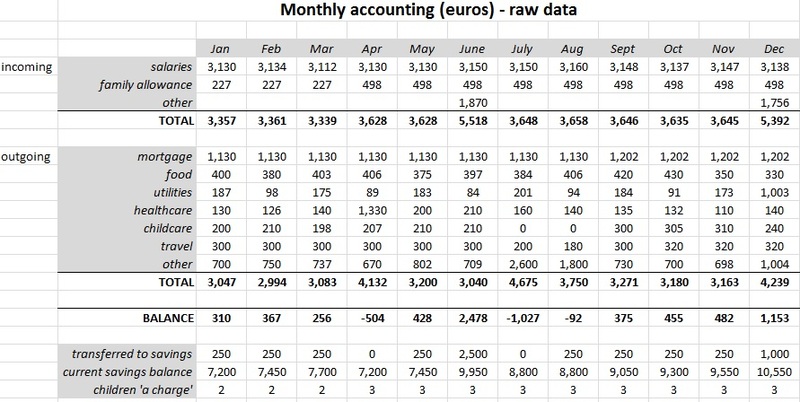 Is a chart a better way of showing growth than a table? Should I add some images to my PowerPoint? And what kind of visual style should I use? What’s wrong with this slide? That’s already a lot better! ..now, in the context of the greater presentation, we know immediately what this slide is about. What next? …but if you do that, bear in mind that your printing costs will be higher. Consider having a dark-background for the wall and a white background for the handout. …immediately much better. Of course, don’t forget to customise your colours to suit the company branding, or your marketing guys will be really unhappy ! OK – its getting better. We are close to the minimum (maybe…) but its not very visual. A visual slide will work much better for the majority of people. Avoid old boring dodgy clipart – we’ve all seen it all before and it doesn’t make you look clever! If you are going to steal copyright (which I know you wouldn’t do…), don’t take the image with a watermark for copyright on it. It just looks lazy. Where should you put images when there is text on the slide? If you have text which is justified to the right, then of course you could line your image up better on the right. And if you have just a few bullet points that can be creatively placed to line up better, go for it. Click here to see one of my own examples. Personally, I think we’ve come a long way from our original text-driven slide. We have gotten rid of a load of text, we’ve made more contrast and added a message-driven image, which is in the right place. Some people would stop here and depending on your style, that might be the right choice. But personally, in terms of minimum effective dose (within the greater framework of the entire PPT) we can do a lot better. Hurts to look at? It should! That’s the point! ..but hang on a minute: The text says that an example of an abrasion is road-rash or something you get from sports + play, that’s its a superficial wound, that it hurts and that its prone to infection. Doesn’t the image already say all that? Wouldn’t the following do just the same? For some people, this is too much. For me, it really is the minimum effective dose. For me, its an awesome big bold visual message. ..but if you just want to keep self learning, skip to the references at the end of this blog. There’s a lot of great content! 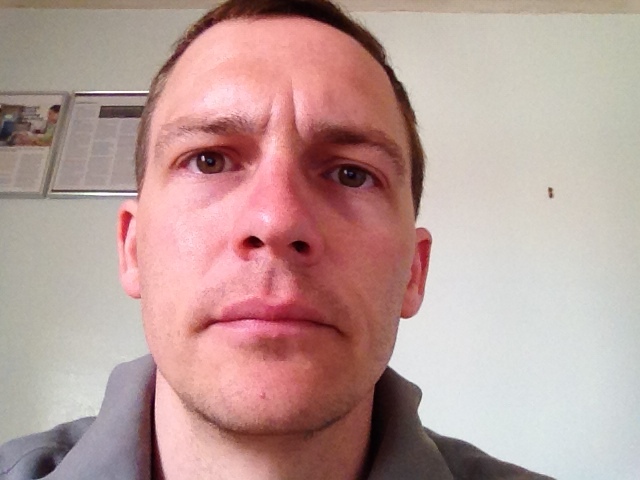 Training, 21st and 28th March 2013 – What’s In It For Me? If you know someone who can profit from this training, please feel free to share the link. What Can You Learn From Dora-the-Exporer About Presenting? For many years, the business world has used one common solution for almost all presentations : Microsoft PowerPoint. If it wasn’t PPT, it was a contending version of the same linear slide-by-slide presentations. In April 2009, architect and visual artist Adam Somlai-Fischer publically launched prezi , a different creative and visual presentation software. Using Prezi, you can make presentations that will stand out from the others, panning + zooming through content on one large beautiful presentation canvas. As with all my training, you can expect a dynamic and fun learning environment, with good sharing and plenty of real hands-on learning. Prior to training, each participant will be invited to do some pre-reading on the fundaments of an effective presentation and watch a short video introduction to the tool and trainer. In addition, participants will be invited to connect via LinkedIn to avoid spending 30 minutes “getting to know each other” during paid class-time. On day 1 of training (4 hours), each participant will create a first basic Prezi presentation step-by-step with the trainer. In this way, everyone leaves the room understanding how the tool works and all different functions. 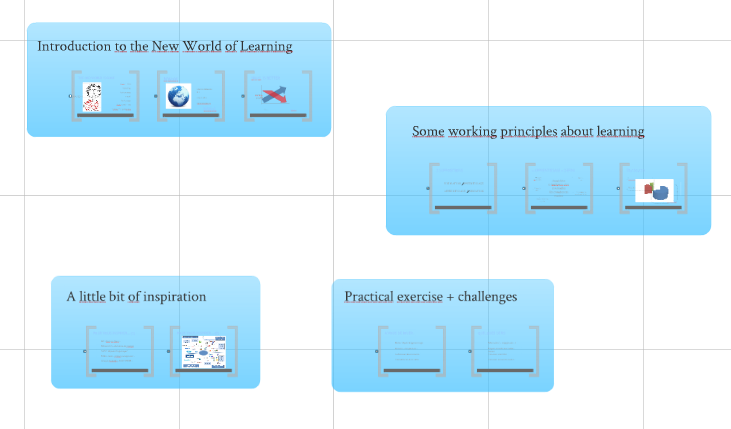 Between day 1 and day 2, participants are expected to make/refine a Prezi, using whatever functions they want and implementing learning from the first session. Day 2 begins with an evaluation of the homework, sharing ideas on what looks great and what doesn’t work. Participants are then invited to learn advanced Prezi-ficaction skills. As per all my trainings, after each day an email is sent with additional references and learning points for the inspired and motivated learner. 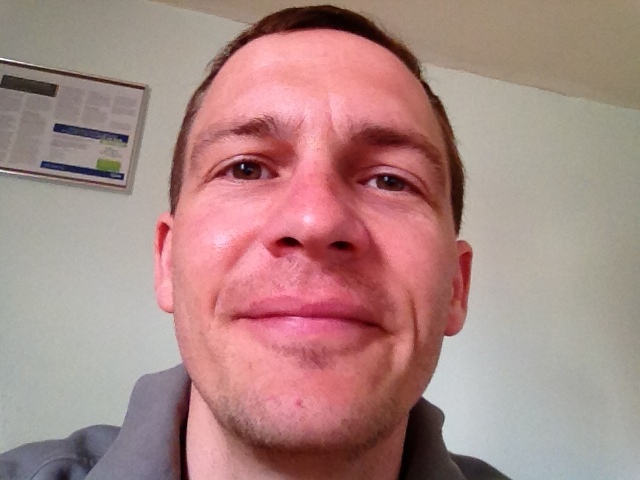 Participants are invited to join the Dan Steer LinkedIn group on “Presentaiton Skills” to continue their learning with other presentation makers from my network. By the end of this training, you will have a complete overview of the tool, have created your first Prezi, got feedback on what looks good and what needs improving and be ready to continue making your own presentations ! Already using Prezi and need some help? Thanks for reading and sharing..
Over the last few months, I have been browsing around for cool prezi tips . This post lists all my favourites. Please share! 9 BASIC TIPS ON PREZI STRUCTURE, PREZI CANVAS, IMPORTING POWERPOINT.. This is in line with my work on how to make a presentation in 5 steps. In Prezi, focus first on getting the big picture sorted, then add the details. The big picture should be closest to the eye, the details can be smaller, zoomed in. Use the layers. The movement in Prezi is one of the cool selling point features that make us like it, but as with any presentation, your content needs to be minimum effective dose : do what only is necessary to support your needs or message. 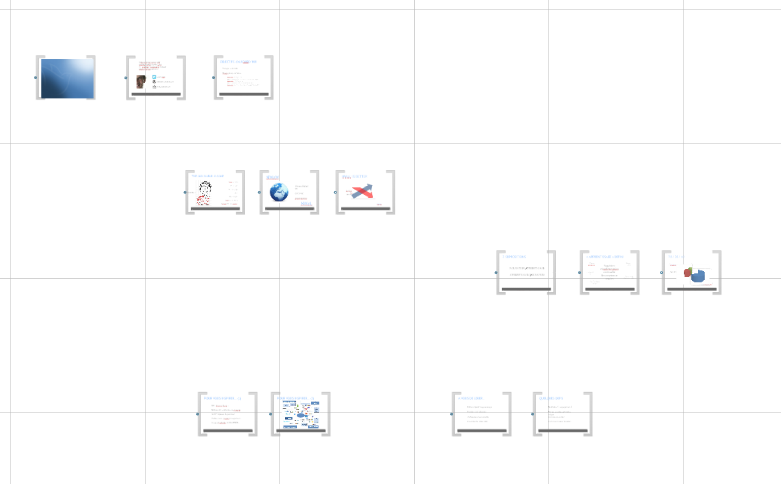 If you are clear about your presentation structure, then you know more-or-less what your final Prezi path is going to look like from the start. But don’t worry about the exact order until you have finished adding everything. You WILL make changes anyway. 5 You can “bring-to-front” or copy/paste just like in PowerPoint.. Note: I don’t mean zoom in/out, I just mean that in any one 2D-position on the canvas, you can change which things are on top of others, just like would in PowerPoint. Just as you can group things in PowerPoint, you can do the same in Prezi. 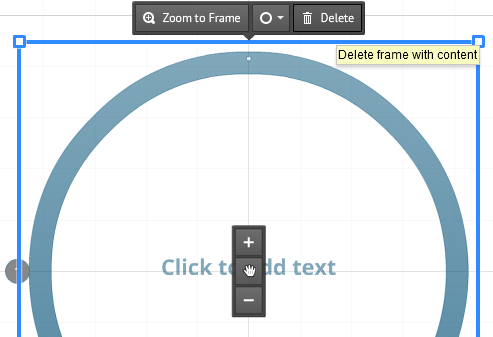 Yes, you can import PPT into prezi! Watch this movie for a functional explanation. Read my post: “Import PowerPoint to Prezi with Style: 10 Steps, 20 minutes” to see how to do a good job of this. 10 If you want your rotated text to still look rotated in “SHOW” (presentation) mode, you can..
Just put an invisible frame around it and point to that (instead of the text itself) when you create your path. The guys at Prezi send me emails with tips from time-to-time and this is one of my favourites. The backgrounds that are possible with 3D and multiple 3D are awesome. At any moment when you are editing your Prezi, you can click on “Theme” and scroll down to the bottom to “Save Current Theme”. Easy! Most obvious music file types will work (MP3, M4A, FLAC, WMA, WAV, OGG, AAC, MP4, and 3GP) and certainly if they already work in iTunes. Prezi will convert them if necessary. Have a look at this Prezi. You will see that I’ve added sound files at specific moments in order to explain my content. This takes a bit of work, but is really easy. Record your sound file. You can do this with your PC (sound-recorder) or, as I did, with an iPhone. Prezi ZenDesk has published a tutorial on how to insert music into your Prezi – this tutorial explains tips 16 and 17 in detail so you can add music in the background or at specific steps. When actually delivering a presentation, it might be good to first say a word about a video before showing it, but you other times you might want it to play automatically. Today (6th May 2013) when you insert a YouTube film, Prezi puts a frame around it and adds the frame to your path. This means that the film will not play automatically. You have to click it. If you change your mind, just put a frame around the film again and add the frame to your path. This will mean you need to click on the “play” icon to play the film. If you are making flash files for Prezi yourself, work with a 30fps frame-rate. That’s the speed Prezi will run it at, so you won’t get any surprises like my friend who had prepared a jogging Flash man who ended up sprinting! Animated GIF files do not work in Prezi. You need to convert them to an SWF (flash) file first. You can do this with a free GIF to SWF convertor. More information from the Prezi team here. Be careful when you delete a frame. It will delete everything inside. Unless …. Really. Just stop it. I’ve seen so many people struggling in training. Just buy a mouse! 25 Prezi has shortcuts too. Use them. 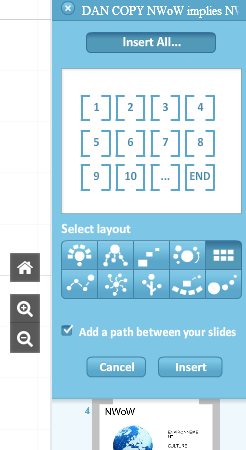 Here’s a list of keyboard shortcuts you can use when creating your Prezi online or on the desktop version: http://prezi.com/learn/keyboard-shortcuts. If they don’t work, you need to enable shortcuts via the settings menu on the top-right of the Prezi you are editing. Your remote will take you through the path. Simple as that! For an example of what I mean, have a look at this post. It’s quite simple to do, but not so obvious to figure-out. 28 Use your Prezi as a whole website!! If you don’t want to develop a whole website, why not just use Prezi as one. You can have a Prezi presentation as your homepage, with none of the prezi.com page around it. Prezi.com has a high SEO score and is a really popular site. Presentations published on the Prezi platform are easily found by Google. If you want your Prezis to be found by Google-searchers, then use good keywords in the title, eg: Your company name + content-related words. Easy! Just click on “print” in Prezi and save a PDF copy. If you are using Prezi in Europe, do it in the morning. It goes a lot better, probably because the USA is still sleeping. …and use Firefox. Its far more reliable for Prezi editing than Internet Explorer. This is perhaps the world’s most obvious Prezi tip, but in case you (like me) were wondering: If you update the title of your Prezi presentation, it will correspondingly update the url. Bearing in that Prezi is pretty SEO friendly, this may have a positive (or negative) impact on your page-ranking via search. Subscribe to my blog on the top-right. When presenting for an audience, selling something or even just talking to another person, you need to answer 3 key questions. If you don’t, you will not get the attention or result you want. In “The Presentation Secrets of Steve Jobs” @carminegallo notes one of these questions and says that its the only one that an audience cares about: “How can this help me?” or “How is this interesting for me?”. I agree that this is the bottom-line when it comes to presenting. These 2 examples are quite different. Both are equally direct. Some might say too direct, but the 3 questions are clearly answered.